In 1940, Tallow Chandler Lieutenant Commander John William Hale was awarded the Distinguished Service Order for his remarkable actions during the attack on Italy’s Taranto Harbour. 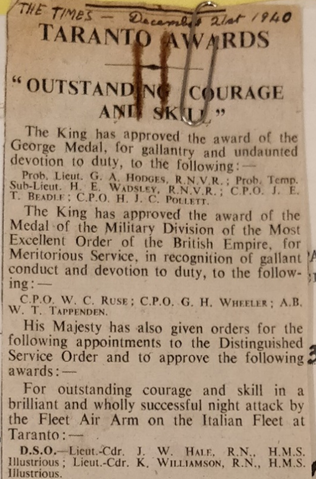 This newspaper clipping, kept in the archives here at the Tallow Chandlers’ Hall, provides a snippet into the life of one of our members on active service during the Second World War. Lieutenant Commander John William Hale became a Liveryman of the Tallow Chandlers by Patrimony in May 1930 and would later go on to become the Master in 1959, with many of his family members also eminent Tallow Chandlers (his father, granduncle, and great grandfather having been Masters of the Company at one time or another). On the night of the 11th November 1940 an attack was launched from HMS Illustrious on Taranto Harbour which was heavily defended by the Italian Navy. ‘The hazardous exploit put half the Italian Battlefleet out of action, with 11 torpedoed for the loss of 2 aircraft. It was described as an unsurpassed example of economy of force. ‘Twenty one Swordfish torpedo bombers took part from the aircraft-carrier Illustrious. The use of torpedoes forced the aircraft to come down to 30 feet and dropping positions were restricted by balloons and net obstructions. A first wave of Swordfish had crippled the battleships Cavour and Littorio. An hour later 5 Swordfish, led by Commander Hale, dived from 4,000 feet to release torpedoes just above sea level, striking the battleship Duilio and scoring 2 more hits on the Littorio as well as attacking the Vittorio Veneto, and the cruisers Gorizia and Trento. ‘Italian shore batteries fired 13,000 rounds at their attackers but each wave lost only 1 aircraft.’ The determined effort of Hale and his fellow men crippled the Italian fleet, drastically changing the course of the war in the Mediterranean and rendering Italy’s Navy essentially useless for the remainder of the Second World War. Also in our Archives, there is a copy of the letter written to Hale’s mother on 29th January 1941, congratulating her on the actions of her son and stating, quite rightly, how she ‘must be very proud of him.’ The letter goes on to enquire about the arrival of Hale’s ‘Christmas parcel consisting of two bottles of port, a cake and cigarettes’, sent by the Company. Similar parcels were sent to members on active service throughout the Second World War as a kindly gesture and a way to keep up morale.